Want “The Best of Times”? See San Diego Musical Theatre’s “La Cage Aux Folles” September 25-October 11 at Spreckels Theatre!! Get glizty with San Diego Musical Theatre- "The LOCAL way to see Broadway"!! Award-Winning San Diego Musical Theatre 'glams it up" for their upcoming production of La Cage Aux Folles on Friday, September 25 (preview) with Opening Night on Saturday, September 26th and running through Sunday, October 11th, 2015 at the beautiful historic Spreckels Theatre "on … Continue reading Want “The Best of Times”? See San Diego Musical Theatre’s “La Cage Aux Folles” September 25-October 11 at Spreckels Theatre!! Play it Cool & Mambo Over to See San Diego Musical Theatre’s WEST SIDE STORY! San Diego Musical Theatre (SDMT) "The LOCAL way to see Broadway", announces the first production of their 2015 season, WEST SIDE STORY, February 13 - March 1, 2015 (press opening on Saturday, February 14) at their new home, the Spreckels Theatre on Broadway in downtown San Diego. The world’s greatest love story takes to … Continue reading Play it Cool & Mambo Over to See San Diego Musical Theatre’s WEST SIDE STORY! San Diego Musical Theatre Presents IRVING BERLIN’S WHITE CHRISTMAS! Want to get into the holiday spirit? San Diego Musical Theatre's Irving Berlin's White Christmas Photo: www.kjphotography.com San Diego Musical Theatre (SDMT) www.sdmt.org Presents their highly acclaimed, holiday tradition for the third year in a row, “Irving Berlin's White Christmas” December 11-21 at the North Park Theatre. This is SDMT's final show of the 2014 … Continue reading San Diego Musical Theatre Presents IRVING BERLIN’S WHITE CHRISTMAS! 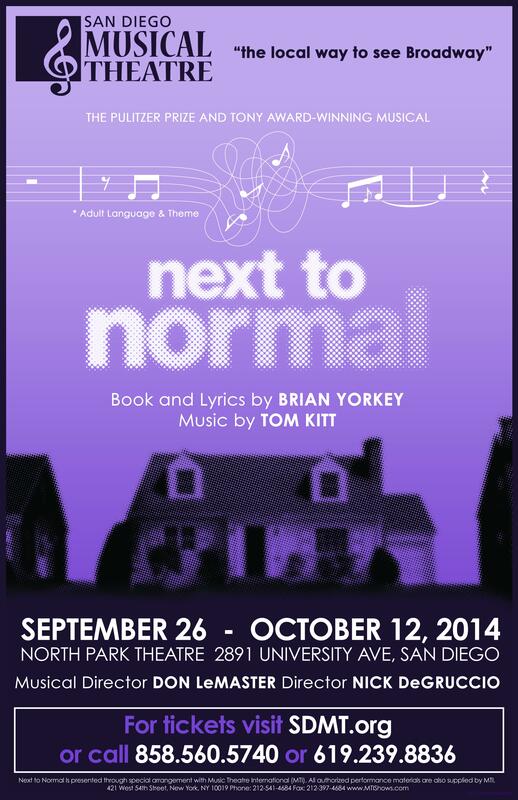 Next up at San Diego Musical Theatre: Pulitzer-Prize Winner: "Next to Normal", September 27-October 12, 2014 at the North Park Theatre in San Diego. Directed by Nick DeGruccio, with Musical Direction by Don LeMaster. Starring Bets Malone (Diana), Robert Townsend (Dan) and Eddie Egan (Gabe). www.sdmt.org or 858-560-5740.